$515,000 @ 3,601 s.f. htd. This Award Winning Home was constructed in the South Valley area. 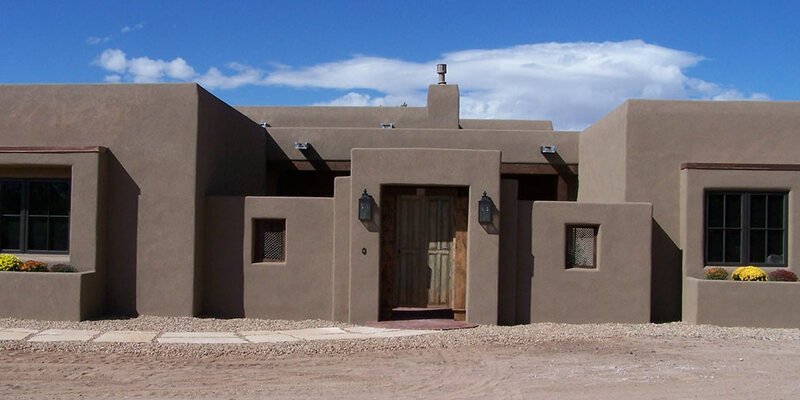 It is a traditional New Mexican Pueblo Style home with a floor plan that is quite spread out and actually seems much larger than it actually is. Part of this was accomplished by separating the living areas of the home from the utility areas of the home (kitchen, office, media room, living room, dining room) by essentially splitting the house in two with a front courtyard area and a rear courtyard area and the two sides of the home essentially being connected by a very open hallway area that also served as the entry foyer. The home had a very open floor plan and the two “hallways” in the home essentially had rooms on one side of the hall and windows that looked into a courtyard on the other side of the hallway. This home made excellent use of natural materials and wood to create the traditional Southwestern/New Mexican feel.